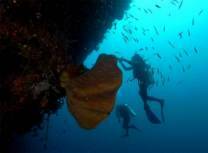 Gorontalo is a relatively new dive destination situated in Tomini Bay a few hours west of Bunaken. The Indonesian town of Gorontalo is a one hour flight away from Manado city in Tomini Bay, Sulawesi. You may pass through Gorontalo on their way to the Togian Islands. However if you stop over for a few days and dive Gorantalo you'll discover some splendid diving that is only now beginning to receive international attention. If you want to get away from the diving crowds, this is the place to go. There are over a dozen dive sites charted so far with healthy reefs and impressive marine life including several newly identified species and wonderful macro critters. Dolphins are often seen in the bay on the way to and from dive sites. Visibility is good and conditions are normally calm with mild currents. The diving season is November to April.